Make your own wine aroma kit for practicing wine aroma description whenever you need to. You just need a base wine, different produce, spices or materials, and of course some time to plan ahead. The aroma references will have to be used within the next few days of preparation. I found training for wine aroma identification more efficient when aromas are presented in a base wine, so to mimic a real wine tasting situation. I also found through my research that the training efficiency was higher when references were real products (e.g. real fruit versus an aromatic composition) or were real wines with distinct characters (see Sulmont et al, 1999). How to choose the base wine? A base wine is by definition neutral, without faults, without strong aromas, tastes or mouthfeels. The best base wine I found for creating my wine aroma kits are in bag in a box, which mean you also have a large volume of the same batch to play with. Prepare these wine references directly in a wine glass or in an hermetic container that you can store in the fridge if you don’t plan to use the aroma reference right away. If you add pieces of products in the wine such for green bell pepper, let them macerate for 30 min to an hour and remove the pieces so that you don’t have any visual cues if you try to recognize these aroma references blind. Use a “control wine” in your wine aroma kit, i.e. a wine without any addition to help you compare the wine without and with the aroma. It helps with the process of identification. Below are some recipes for wine aroma references, borrowed from Dr. Ann Noble. 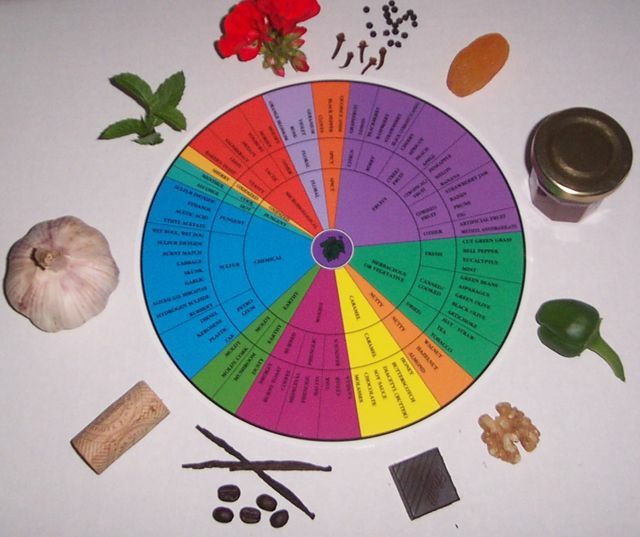 Indeed, these references are a good complement to the wine aroma wheel. Moldy Cork: the BEST standard is the actual example of the defect. Save a spoiled wine which has a moldy odor, produced by TCA (trichloroanisole). You can freeze the cork-tainted wine for future reference so that it won’t oxidized. Caution: Many asthmatics are very sensitive to it! Sulmont C., Lesschaeve I., Sauvageot F. and Issanchou S. (1999). Comparative training procedures to learn odor descriptors. Effects on profiling performance. Journal of Sensory Studies. 14 467-490.